Need more info about this product? Ask us whatever you need to know and we shall do our best to respond quickly and in detail! 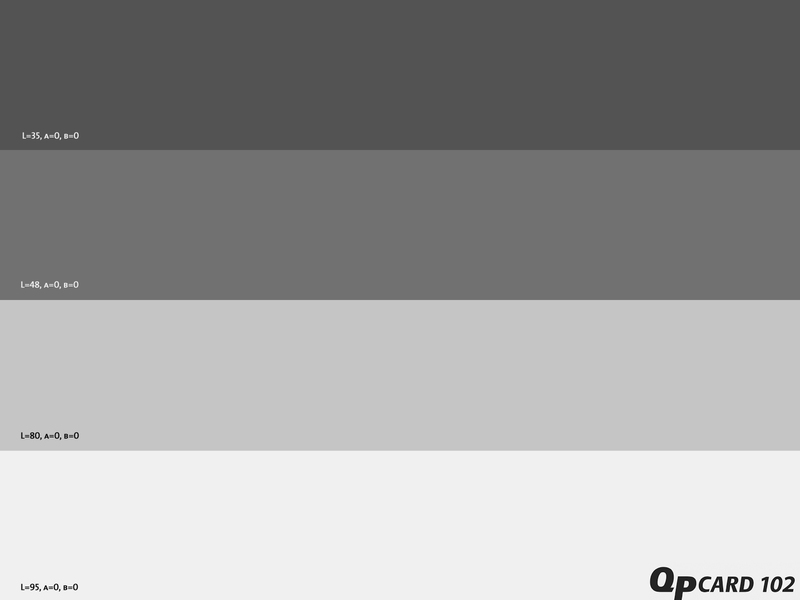 perform visual checks on the color neutrality of computer displays and monitors. Although it shares the majority of its functions with the QPcard 101 pocketable WB reference card, the QPcard 102 has several advantages over its smaller sibling. Most significantly, the QPcard 102 is designed to be used inside the studio and that is why it is much bigger (243 × 170 mm). 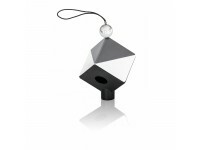 It is also manufactured from durable cardboard free of UV-reactive whitening agents. 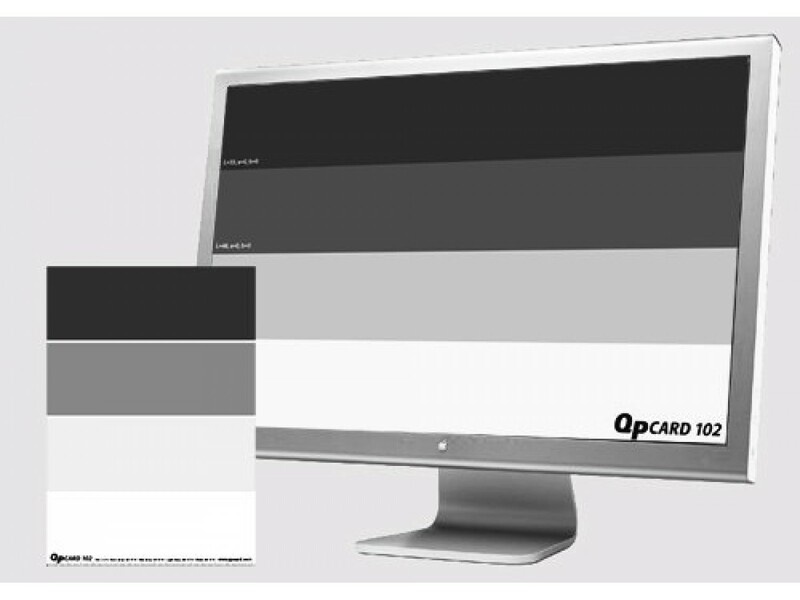 The front surface of the QPcard 102 has four patches: white (Lab value 95*0*0), light-gray (Lab value 80*0*0), mid-gray (Lab value 48*0*0) and dark-gray (Lab value 35*0*0). The mid-gray patch is specifically designed to reflect 18% of the light and can thus be used for exposure control. The patches are laid using special spectrally-neutral, low-reflection pigments. 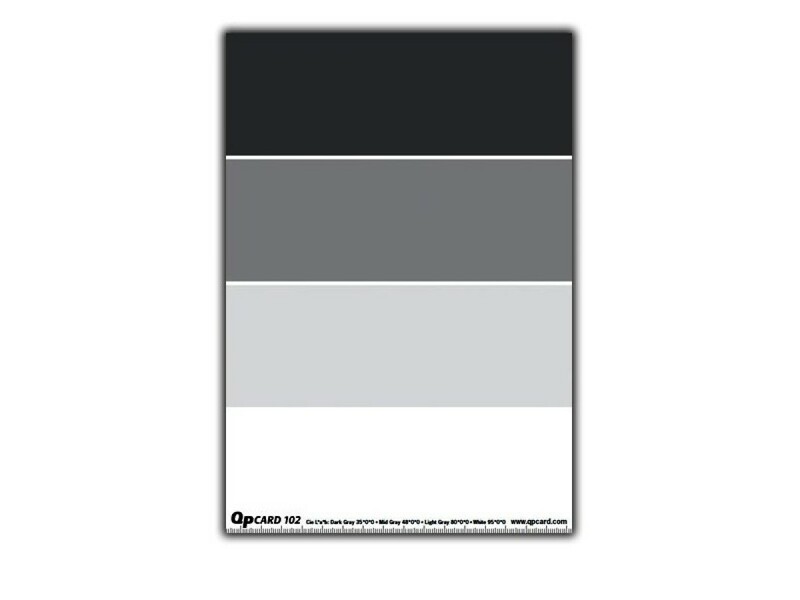 This enables the photographer to use the QPcard 102 reference card under various and variable lighting conditions without concern for the appearance of metameric effects. The patches are highly fade-resistant: according to manufacturer data, the usable life of the reference card is minimum 6 years with normal use and proper storage. the Curves tool inside Adobe Photoshop can accept up to 4 correction points. 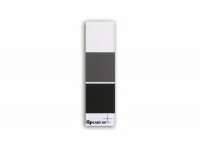 Besides determining exposure and white balance, the QPcard 102 can be used to quickly check the color neutrality of any computer monitor. To perform such a check, the user must place the reference card next to the monitor and compare it to the output of an identical digital image of the QPcard 102 on the computer screen. 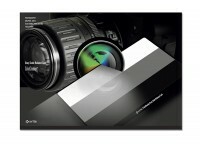 Using the card as a visual reference, the photographer can proceed to manually adjust the brightness, contrast and color balance of the display to achieve maximum neutrality. Such comparison adjustment does not make monitor calibration unnecessary but is helpful in cases where the monitor used for review and processing is not calibrated and cannot be trusted.